You hit the nail on the target Andy. Is this a deus ex machina which would certainly prove God is a Republican? Palin usually wears skirts. The empty pants-suit is Obama and he's running for President. "With Bush and Cheney's combined approval ratings of about 40%,..."
A 40% approval rating is 3 times higher than the Democrat-led Congress. You seem to be running out of intellectual things to discuss on your blog. I thought you are supposed to be a fresh voice. I guess blogging about "hope" and "change" and the empty-suit Messiah becomes stale for even shills like yourself after a while. I think buyers remorse is setting in on the Democrat side of the Presidential election. Don Fowler, Michael Moore, Olbermann and Ostroy have all used the potential diaster of Gustav to make offensive political jokes. And Fowler's defense that he was only mocking Falwell is no escuse. Of course it was equally offensive when Falwell said God sent the 9/11 disaster because of women and gays. It's time we quit blaming God and took responsibility ourselves for what we say, do and think. ...but, Democrats don't teach 'responsibility'. They teach 'hope', 'change', and the promise that the government will do everything for you. 40% is combined for Bush and Cheney, so I wouldn't be making any boastful comparisons if I were you. And besides, Congress, last time I checked, is almost half Republican, so it's a little disingenuous of you to portray it as a Democratic body. But that's what you Repugs always do...stretch the truth and lie. Question for ya pal, why do you waste your time here if I have nothing intelligent to say? And to Anon 9:56, lighten up, Sparky. You repugs seem to e losing your sense of humor the closer to defeat you get. It seems I'm getting a little under your skin. I've taken over the discussion in your threads without much effort at all, you deleted one of my posts last night in this thread, and you are responding to my comments at a higher frequency. Maybe if you can use facts to prove me wrong, I'll go away. Of course, liberals don't like facts so I predict I'll be here for a while. 4. And, I don't have time to list the economy, fuel, and on and on and on. And to top it off, Falwell blames God instead of the Republicans. Most of the Dems in Congress are empty pants-suits. We are a country of wimpy leaders. When someone like you posts a list of MoveOn.org bullet points, I can tell where this thread is going to go right away. I'll bite, though, for the fun of the debate. "1 Bush got intelligence that bldgs. were going to be bombed and instead of taking responsibility he went to TX on vacation;"
1. My first point is something that Democrats just don't seem to understand - Bush is not running for President. I'd love to have a debate with a liberal that doesn't just say "George Bush", but I guess your hatred prevents your from thinking clearly. 2. The August 6, 2001 Intelligence Briefing that you are referring to doesn't actually provide enough detail to know that the 9/11 terror attacks were a month away. Liberals always point to this memo, but never say what THEY would have done on August 6th to prevent 9/11 from happening. Do you think Bush should have stopped all commercial air travel on August 6th after receiving the briefing ? Do you think Bush should have ignored the civil liberties of the would-be terrorists before a crime was committed ? 3. The first time a 9/11 style attack was discovered to be in the planning stage was January 1995 (Project Bojinka). Osama Bin Laden declared war on the United States on February 23, 1998 - on Clinton's watch. The 9/11 Commission Report documents multiple times that the Clinton Administration could have killed/captured Osama Bin Laden, but decided against it. "2. Katrina hit and Bush finally flew over and looked down from a plane;"
The Democrats that control LA are the first responders to a crisis in their state. They failed miserably; then FEMA and the federal government failed miserably. Both parties share the blame for Katrina. "3. 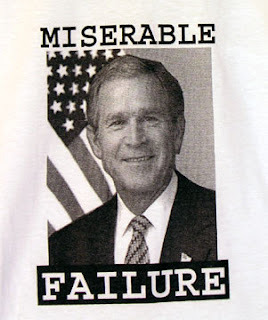 Bush starts a war with the wrong enemy;"
Saddam Hussein started the Iraq War when he invaded Kuwait. The Clinton Administration failed to hold Hussein to his Desert Storm terms-of-surrender obligations. Operation Desert Thunder, Operation Desert Fox, and the Iraqi Liberation Act of 1998 all happened on Clinton's watch. Many Democrat leaders, like Nancy Pelosi, are on record as stating that Hussein was engaging in the development of WMD. "4. And, I don't have time to list the economy, fuel, and on and on and on." You don't have the time or you don't have the intelligence ? Anon....10:24, don't flatter yourself. I just love pointing out to the various Repugs on this message board what utter losers they look like hanging around here non-stop while saying what an idiotic site it is. But stick around all you like. Who am I to stop you from wasting your time. And to Anon 10:21, I believe that's four years in the U.S. Senate for Obama, not one. Not only do you Repugs lie, you cannot even count! Actually you have to lie to argue with me. I didn't say "...what an idiotic site it is." I pointed out the obvious truth that you are running out of intellectual content because the empty suit your party selected for President hasn't given you any content to talk about. "You seem to be running out of intellectual things to discuss on your blog. I thought you are supposed to be a fresh voice. I guess blogging about "hope" and "change" and the empty-suit Messiah becomes stale for even shills like yourself after a while." The veneer is coming off. 11:35 You are pathetic. Get help. The Dems (not necessarily those running the show) think that the government should be efficiently and responsbily run to protect its citizens so they will not need help through various actions/programs/hand outs by their government ie., the Party in Power at the time. The government/party in power should ensure that the food supply is safe. The government should not start an endless, unnecessary, expensive war. The government should not take jobs awary from its citizens and sent them to other countries. The government should not pander and collude with insurance companies, corporations, and other entities to the detriment of USA citizens. The government should not allow only one segment of the population to fight its wars; there should be a draft. The government should not under equip its service men fighting its war. The government should not allow ex-soldiers to live on the street or otherwise go without care. The government should not spy on its' citizens. The government should not deplete its citizens resources by catering to illegal immigrants. The government should not lie to its ciitizesn to start a war or for any other reason. There are endless more "should nots" the government/party in power should avoid in order not to deplete the resources and necessities of its citizens. Then there won't have to be any government "hand-out" programs. 232 gpt so emotional about the mess Bush has made, he accidently hit publish before checking for typos. For that he apologizes. 1. So what???? That has nothing to do with the question at hand, but talking to the point is not your strong suit and is an easy way to recongize your Anon. comments. I guess your over-rated opinion of your powers makes you think you can guess and evaluate another's emotions and thoughts. By the way you don't "debate". That's a skill you lack. For staraters you have to stick to the points. 2. Bush should have taken the warning seriously. He should have cancelled his vacation. He should have checked the intelligence He should have defended us againt such attacks. He should have acted responsibly. 3. The Feds step in in national disasters. Even more need for Bush to since he'd depleted every state's National Guard including LA. 4. Hussein did not invade the U.S. nor attack us. Hussain was not a threat since he had no WPD. Bush et al lied about that. They LIED to AMERICANS to get their little war started to profit from the oil deals. 5. Not only did I not have the time I had the intelligence to know I was responding to a moron and thus wasting my time. I truly hope however, you're on a Brain Transplant list and near the top. Although you glut this blog with your gall, you have do one redeeming quality. Here is the truth Bush Bots dont admit even to themselves. If Clinton or any Democrat had done what this liar has then they would have demanded his impeachment and imprisonment and worse! But facts dont mean a damn thing to these fear and smear artists. They change "facts" as often as Bush changes the reason why we invaded Iraq. The Plame incident and their attempts to justify it and the cover-up afterwords shows these people want power and are perfectly willing to destroy this country if that is what it takes to get it. I dont understand why they hate America so much that they support a war whose main beneficiary is Iran. I guess they figure its ok as long as the gay cant get married! I read the idiotic posting by anon at 10:54 who has given us yet another reason for this war! I was going to take the time to post a refutation but what a waste of time that would be. Repugs dont care about fact or anything other than promoting their own narrow minded self righteous bigotry, facts be damned, all masked under the guise of patriotism and family values. I am not sure how you refer to a poster as someone posted at 10:54 and what surprise to read yet another reason for the war. First it was WMDs, then connections to Al Quida, then the cause of freedom and now we are told this war is because we were enforcing the terms of surrender for the First Gulf war!! Keep trying and maybe you will find a reason that sticks!! PS our moron of a Republican governor tells us that sooner or later we will find the connection between Saddam Hussein and Al Quida.. Hmm now isnt it generally assumed that people find reasons for war BEFORE the war and not AFTER? Typical of this "Hate America" mentality of the Republicans!